The Performance Plus Dance Team consists of talented and exciting young dancers ages 5-14. 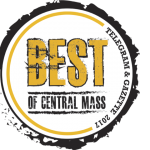 They perform for distinguished audiences and community events throughout central Mass. Some of their performances include halftime shows for the Worcester Railers, Holy Cross College, and local high school basketball games. They also perform in parades, various stage shows, and festivals. In past years they have particiapated in stArt on the Street, Columbus Days Parade, St. Patricks Day Parade, Chain of Lights Festival. Performance Plus dancers are also featured performers in our annual recital! All of the girls LOVE performing with P+. P+ helps build self-esteem and confidence. The dancer learns good sportsmanship, responsibility, dedication, and TEAMWORK. P+ gives dancers the opportunity to perform for many audiences without the pressure of competition. Dancers also build strong bonds with their teammates and create lasting friendships. Interested in joining our competition team? Ask about our all-star team the KNOCKOUTS. These are the a group of dancers who love performing and would like to train for the next level. Every student is invited to perform at any of our Performance Plus events and competition events around Massachusetts.